SWIMMING, BOATING, KAYAKING, PEDAL BOATING, WATER SKIING AND EVEN FISHING as well as other Water Sports are a Great Way to Work Out! Working Out in the water will keep you cooler in the Summer Time too. For Me. Most Water Sports do not even feel like Work Outs. Believe me. I know it is not easy to shop for and worse wear a Swimming Suit out in public. But it is worth it once you get out there and enjoy yourself. If wearing a Swim Suit bothers you. Wear a T-Shirt and Shorts. Have a GOOD Time! Live Life and Lose unwanted extra weight off your body. Summer of 2014 I fell in love with riding a bicycle again. I was losing weight and wanted MORE! We bought a Pedal Boat and took it out on the Lake. I love it! When riding a bicycle or pedaling a boat, it I am having so much fun, it does not even feel like a Great Work Out, but it is. A fun body Work Out at that. 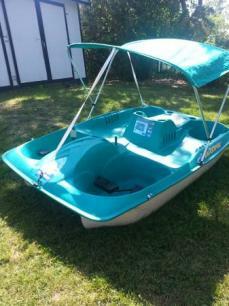 Would you believe that the Pedal Boat is also set up for fishing? And it has a Sun Tarp, so that the users do not have to sit in the sun, they can have shade. We enjoyed the Pedal Boat so much that Deron, who has wanted a Canoe. He would like to get the upper arm work out too, since we do ride our bicycle quite often. And we are still thinking on that one, as of this writing. 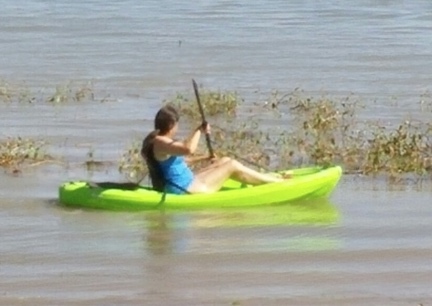 I decided I would like to have a Kayak. We bought the type that we could Stand up on for the Stand Up Paddling Sport. 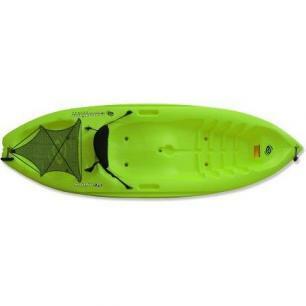 Deciding on the color was harder for me than the type of Kayak I wanted. I chose the Lime Green...to match my FATTY Bicycle. 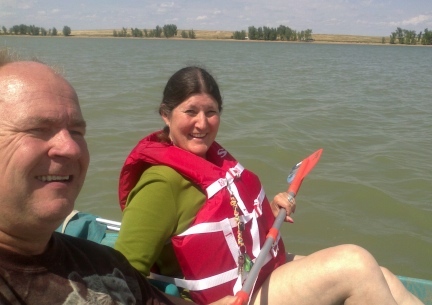 We took the Kayak out the first time to the Belle Fouche Orman Dam Lake. We met friends there on a not too warm, but so windy the water way wavy day. It was a bit cold, but 4 of us gave the Kayak a go, and LOVED it! Going to the Lake, as long as we do not eat too much of the wrong foods, will be a great way to get a Great Work Out in...even if we just swim! I DID IT! I LOST 50 POUNDS! The Bicycles and the Work Outs and the Boating and Walking and Such IS WORKING! That and eating right. Eating right! It matters! These are photos of Deron and I out taking turns getting a Great Work Out on a pretty choppy Lake with our Kayak. We do plan to buy another Kayak next year. These photos were taken 7-31-2015. My 50 pound goal was met on7/28/15. Get Out And Have Some Fun......drop the fat off your body! We Bought Sit In Kayaks! My Heath, My Weight, has improved. My Husband's Health, my Husband's Weight, has improved. Not only that! We are getting out and having so much fun. When you paddle a boat, you use your upper body....we ride bicycle regularly. Deron, my husband thought it very important for, him especially, needed the upper body work out. 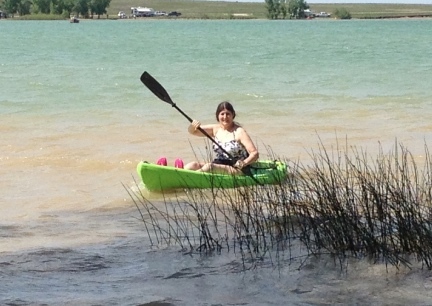 We were sharing the one Kayak and taking turns paddling. 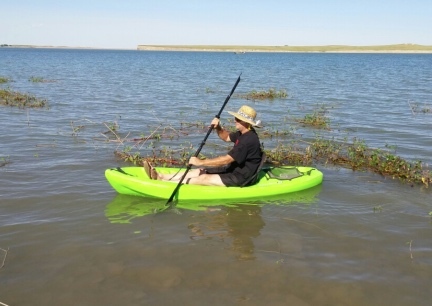 Deron started shopping for a Sit In Kayak that he could Fish from as well as use to Paddle for the sake of paddling. We found them on sale, and Deron said I should get one too, a Pink One! 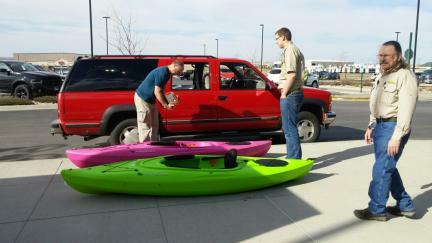 Here we are, in this photo, loading what we thought was the best Kayak for the best price. The contents of this page, we plan, will be ever updated with more fun! The idea is to make YOU want to get out and enjoy life, get out and play!